With a stocky build, the Bulldog shares many common names with other stout breeds. Names of Greek gods, professional athletes, and other strong figures have been lending their names to the Bulldog for decades. Some of the more popular options are Zeus, Apollo, Tyson, and Rocky. Due to their extremely stout build, owners also tend to choose names related to motor vehicles and other machinery. Dozer, Tundra, Dodge, Torque, and Yukon are a few typical names that fall under this category. Being a highly popular mascot, many other Bulldogs have names related to various sports teams and traditions. The Bulldog developed much of the strong build as an adaptation to their early usage in Bull-baiting. Due to the extremely strong grip developed, names like Jaws and Chomp are frequently adopted. Some of our pages will contain a subcategory. A subcategory is a slightly more specific grouping than the main topic of the page. For a subcategory, we will include a separated table of names and corresponding descriptions. An example of a subcategory of Red Dog Names would be 'Dog Names Inspired by Red Wines'. 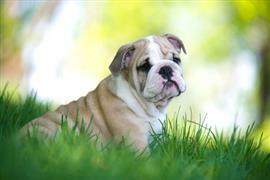 If you have any subcategory ideas for the Bulldog Names page, we would love to hear them. Use the form below to submit your ideas.